This accessory features the amazing rendered 3d maps produced by Ø1 Games. The maps come with 1 inch square grid. 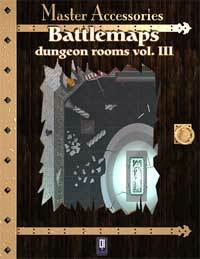 Dungeon Rooms Volume III enhances the features of Dungeon Rooms Vol.I and Dungeon Rooms Vol.II You will find, of each map, three versions: full color, grayscale (optimized for B&W printing) and line art. 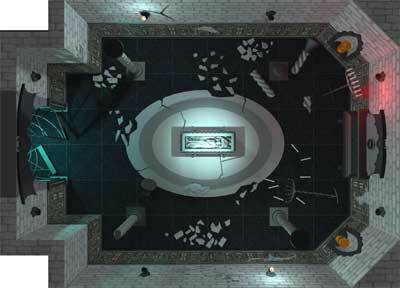 In Dungeon Rooms Volume III you will find more dungeon rooms to build your custom dungeon complex, including the vampire lair, the treasure vault, the throne room and more. 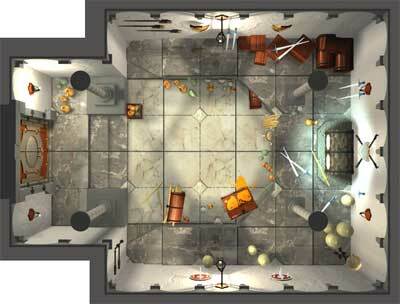 These maps are so detailed that simply looking at them can give thousand of ideas for your own games. Why does a blade of blue light filters through the vampire's lair gate? 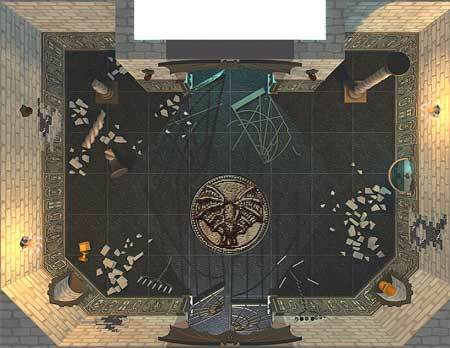 What kind of valuables were in the treasure vault, or who sat on that mysterious throne? You know the answer, and your players will soon discover it. "You step into a large ruined room, a large mosaic depicting a menacing bat lies under your feet. The smell of decay is strong here. Against the east wall there is a small stone fountain, some liquid rests perfectly still inside the stone basin. Right before you there is another gate which seems to be unhurted. Flanking the gate stand two candle holders, one of them lies shattered on the floor..." ."